All too often, motorcycle batteries die young, murdered by neglect. Dehydration, improper charging, and a slow discharge during storage all shorten a battery’s life. But it doesn’t have to be that way; how long your battery lasts is mainly up to you. Motorcycle radios, clocks, alarms, computers, etc., draw a small current even when the ignition switch is off, which can drain batteries within a few days. To prevent these draws from killing your battery, you could disconnect the battery, but even if there is no load on them, batteries self-discharge. When batteries are left discharged they quickly become sulfated and may permanently lose the ability to be charged, so always recharge a discharged battery as soon as possible. There are three major types of motorcycle batteries: conventional “wet cells” with liquid electrolyte, gelled electrolyte (gel cells), and absorbed glass mat (AGM) or “dry cells.” Wet-cell batteries with removable caps contain lead-antimony and are the least expensive, but require periodic refilling. Wet batteries marked “maintenance-free” with semi-removable caps usually contain lead-calcium plates that use less water, although in some cases, they can still run dry. Gel batteries contain a jellied electrolyte that doesn’t splash easily. Gel cells are more tolerant of being left partially discharged and they don’t self-discharge fast, but they cost more than conventional batteries. The most expensive type is absorbed glass mat, which uses silica-glass matting that makes them maintenance-free. While AGM batteries typically cost more, they have higher efficiency and power than other types, are the most resistant to vibration, and usually last considerably longer. If a motorcycle is stored for several weeks or longer, keep it on a “smart” multi-stage maintenance charger with separate bulk, absorption, and float modes. During extended storage, remove the battery and place it indoors, where it can be connected to a maintenance charger and the electrolyte level monitored. If that’s not possible, or if it’s maintenance free, the battery can be left in the bike and on a maintenance charger. (A fully charged battery will not freeze until the temperature dips to -92 degrees F, but when discharged, they can freeze at just a few degrees below the freezing point of water.) Often, we don’t expect to leave the bike as long as we do, so make it a habit to connect it when parking at home. Many chargers come with external quick-connect plugs that only take seconds to use. New batteries must be fully charged before placing them in service. Batteries should be recharged at a rate not exceeding 20% of their ampere-hour (A-H) rating, for example a 2-ampere maximum charge rate for a 10 A-H battery. Frequently discharging a battery below 50% of its capacity also shortens its life substantially. Regular charging voltages should be 14.2-14.6 for wet cell, 13.8-14.0 for gel cell, and 14.1-14.4 for AGM. Recommended float-charge voltages are 13.2-13.7 for wet cell, 13.2 for gel cell, and 13.2 -13.4 for AGM. Batteries contain sulfuric acid so follow all safety warnings. Always wear eye protection, rubber gloves, and old clothing when working near them, and keep baking soda and water handy to neutralize any spilled acid. Batteries vent hydrogen and oxygen that can explode if sparks or smoking occur nearby. Shut the ignition switch off before disconnecting battery terminals, and detach the ground side first so tools can’t spark if they touch metal. 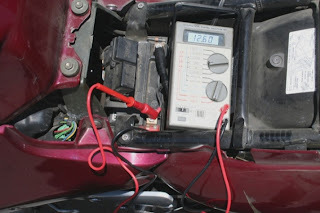 Always connect the negative jumper cable for the dead battery last, attaching it to a clean metal portion of the frame, rather than to the negative battery terminal, so no sparks occur near the battery. Only plug in a battery charger after it’s connected. Be sure to clean and inspect terminals regularly. Electrolyte levels of non-maintenance-free batteries need to be checked monthly, especially in hot weather or when frequently used. If electrolyte levels drop below the top of the internal plates, the battery may be damaged. Use only distilled water to refill, which prevents mineral buildup. All batteries can be tested with a resistive load test, either electronically with a special tester that measures internal resistance, or with a digital voltmeter. Batteries with removable caps can also be tested for specific gravity (SG) with a hydrometer. A fully charged battery at rest should read about 12.66 volts, with an SG of 1.265. A 75% charge yields 12.4 volts or 1.225 SG. A 50% charge yields 12.2 volts or 1.155 SG. And 11.7 volts or 1.120 SG indicates that the battery is fully discharged. Differences in SG greater than 0.050 between cells mean that the battery is worn-out. Great tips. This is very useful because batteries are expensive nowadays especially the big ones. Taking care of it will make it last longer. Thanks for the informative blog. I think every piece of equipment needs maintenance to last longer especially batteries because it keeps the motorcycle going. I agree that batteries are often the most neglected part of a motorcycle. It is one of the most important things to maintain because it gives life to the motorcycle. Better put these things to memory because batteries are getting more and more expensive these days. Thanks a lot for the information and tips. Batteries, like other products, usually go with the price. The more expensive they are, the better the features. Not all work at the same conditions though. They have different features thus, limited on certain functional areas. The age of the battery gives you an idea on how long it should be able to perform. A battery is considered fresh, if it is less than 6 months old.